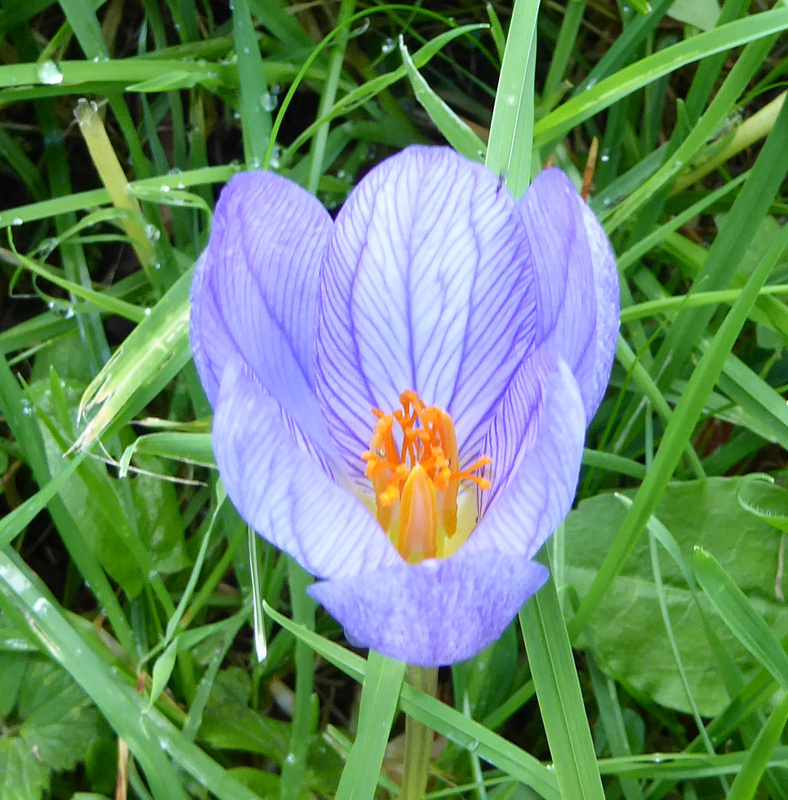 I walk through our local community garden (The Leechwell Garden) most days in summer just to have a look at the flowers and insects but I know that, if I am there late morning, the sound of children playing will brighten the air. The older children, sometimes along with mum or dad reliving their youth, will be enjoying the fine new play area with its exciting slide. 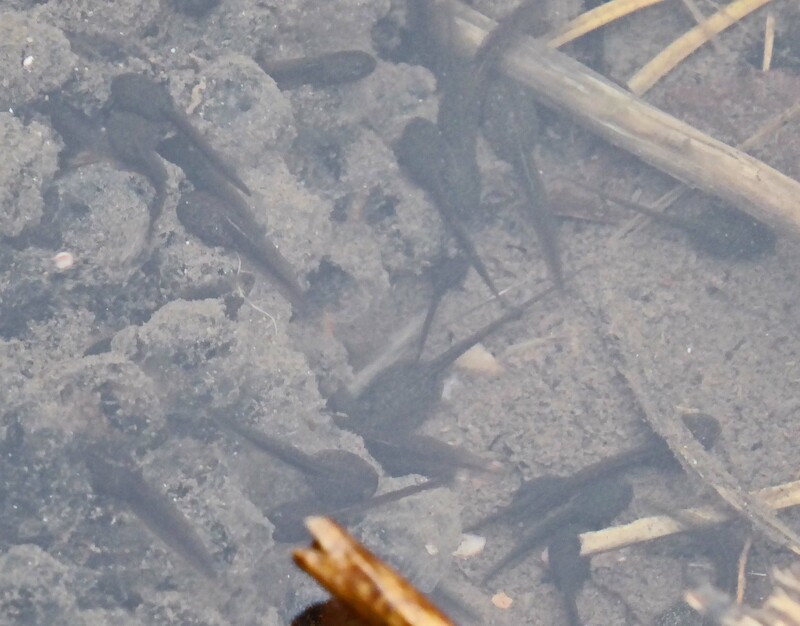 The younger ones may be messing about on the watery edge of the stream that passes through the garden but it is the sand pit that really hits the spot. Children love playing in the sand and I often see several family groups clustered about the sand pit; the only thing that seems to deter the children is heavy rain. It’s a real tribute to the vision of the garden committee that they created something so popular. Male (left) and female wool-carder bees having a rest. One leaf has been well “carded”. 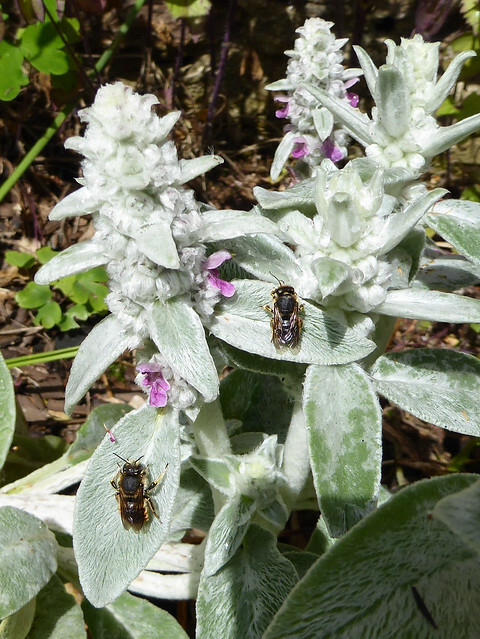 The flowers I come to see are across the other side of the garden and, for the past few weeks, I have been loitering near the old stone wall where there’s a large patch of the plant Lamb’s Ear (Stachys byzantina). 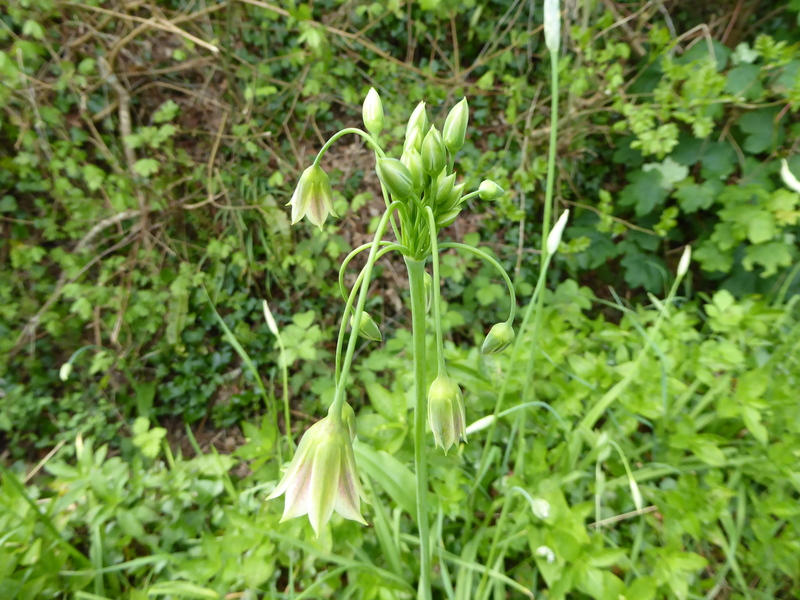 It covers the ground with a jumble of silvery-green, velvety leaves and sends up stout, silvery stems bearing clutches of smaller leaves and understated pink-purple flowers. It’s a pleasant, restful sort of plant creating an old-style, cottage garden feeling but what goes on around these Lamb’s Ears in midsummer is far from restful. From the middle of June, a dark, chunky bee can be seen patrolling the patch of silvery-green leaves and I spend more time than I should watching him. 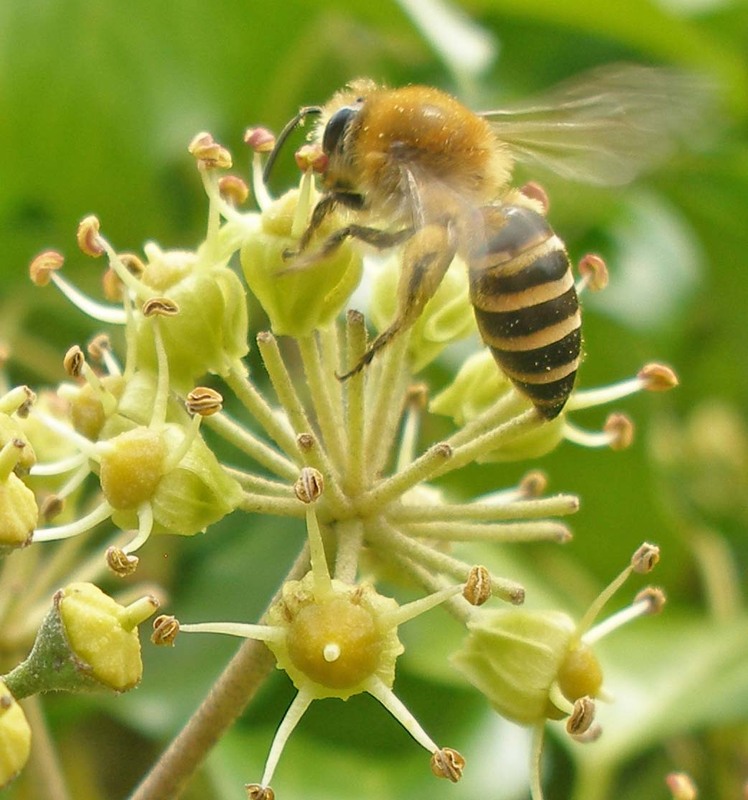 Whereas most bees are gentle creatures keeping themselves to themselves, this one is a bit of a thug, oozing anger and aggression. 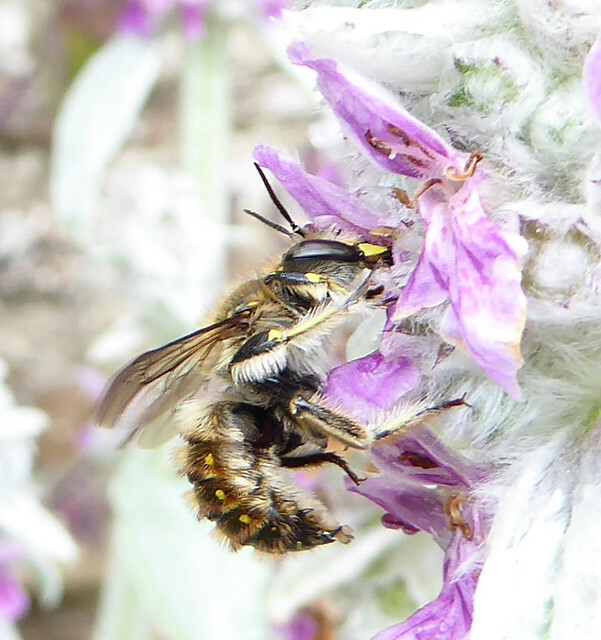 He is the male wool-carder bee (Anthidium manicatum), mostly black but with yellow markings along the sides of his abdomen, head and legs, reminiscent of the warpaint worn by native American tribes. 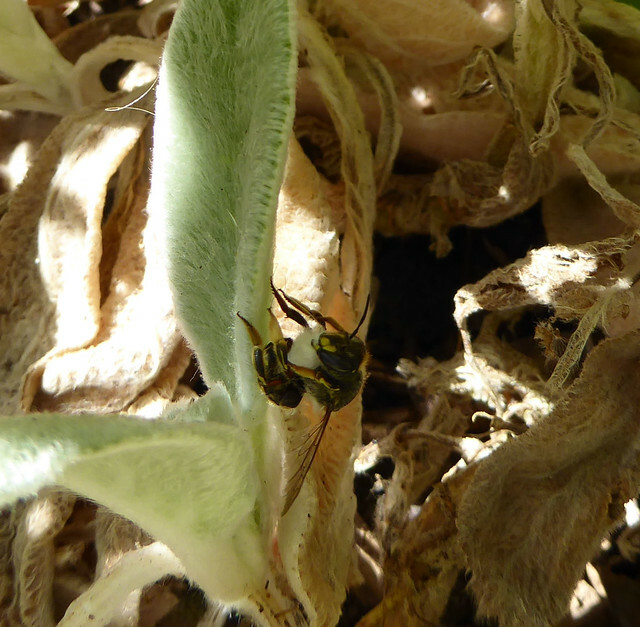 He is about the same length as a honeybee but much broader making him quite imposing as he moves quickly about the patch of Lamb’s Ear. 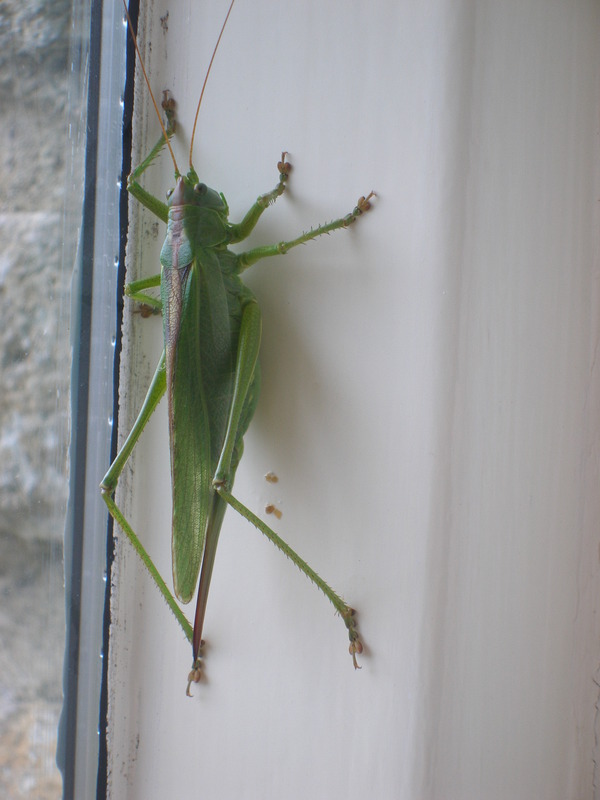 His movement is distinctive, he hovers then moves rapidly to a new spot, hovers, moves, all the time buzzing noisily. It feels like he is looking for something. And that’s exactly what he is doing, looking. Should he spot another male wool-carder bee or a different insect on his patch, he will chase it away by flying directly at it. 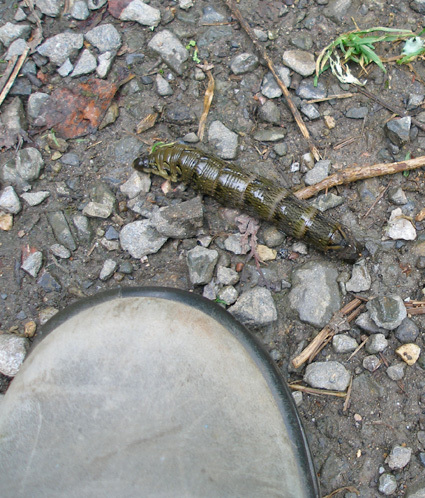 I have seen him attack a bumblebee at least twice his size and knock it to the ground. 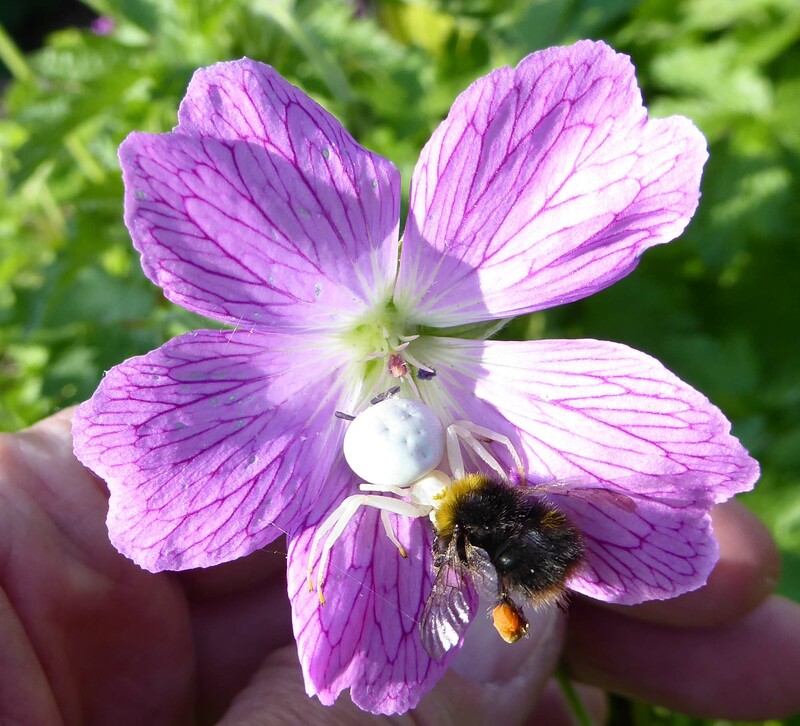 But, not only is he aggressive, he is armed; the rear of his abdomen sports five stout spines which he will use to injure or kill the intruding insects and there are reports of male wool-carder bees disabling honeybees who dared to feed from their patch. 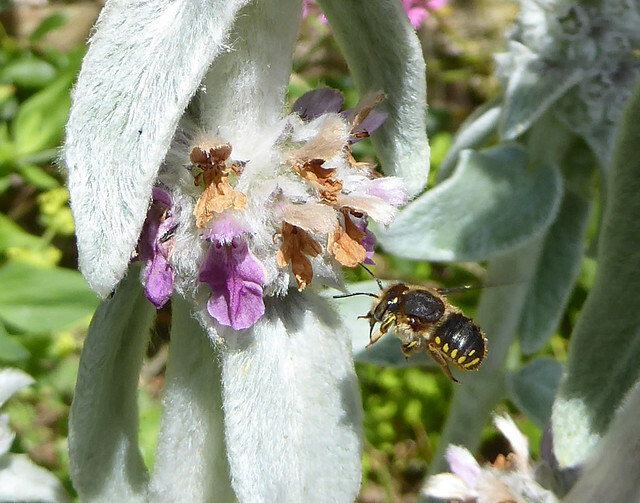 All this aggressive energy is directed towards protecting the patch of Lamb’s Ear for himself and his harem, for now and then a female wool-carder bee will appear. She looks very like the male, only a bit smaller; the wool-carder bee is one of the only species in this country where the male bee is larger than the female. When the male sees her feeding from the flowers he will pounce and, without any preliminaries, mating will ensue. 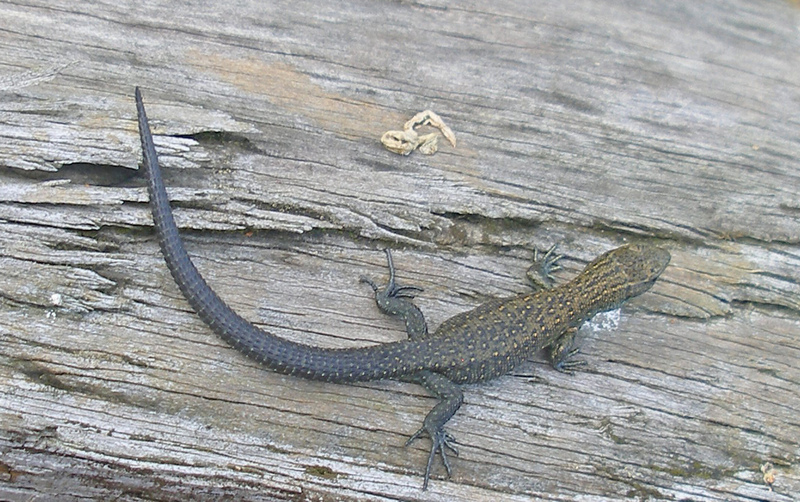 This is a vigorous but brief activity sometimes causing the flower stem to vibrate before the two disengage and go about their business again. 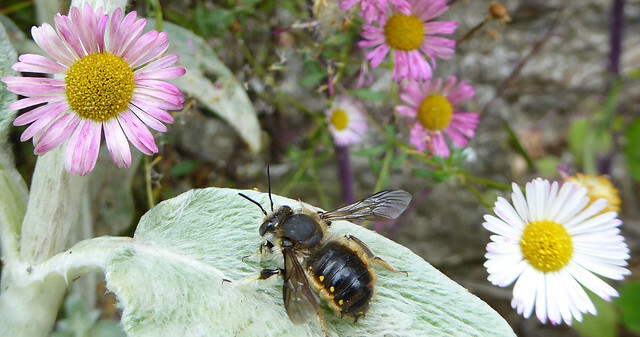 Unlike most solitary bees, where females mate once, wool-carder females undergo multiple matings so that, after a short time, our male will mate with the same female again and should a different female appear he will attempt to mate with her. 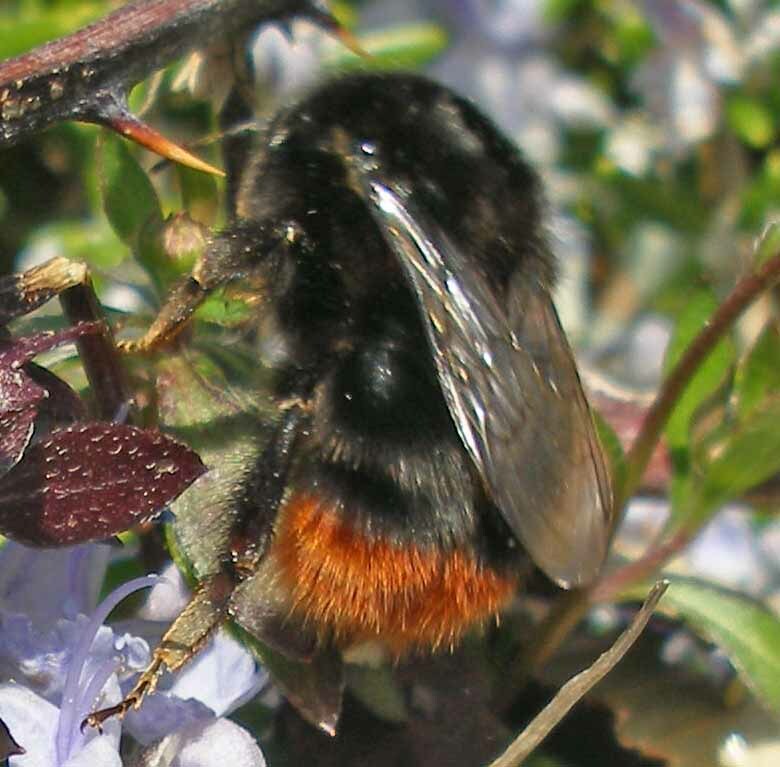 One valiant observer went to the trouble of watching an individual male wool-carder in his garden and reported that the bee mated sixteen times in one day. This focus on the aggressive behaviour of the male wool-carder bee tends to obscure the fact that it is the female that does all the hard work of nest building and egg laying. The wool-carder bee is a solitary species so that individual mated females build their nests alone, unlike the more familiar social honeybees and bumblebees. Nesting occurs in preformed aerial cavities in dead wood, in walls or in hollow stems, including the tubes found in bee hotels. 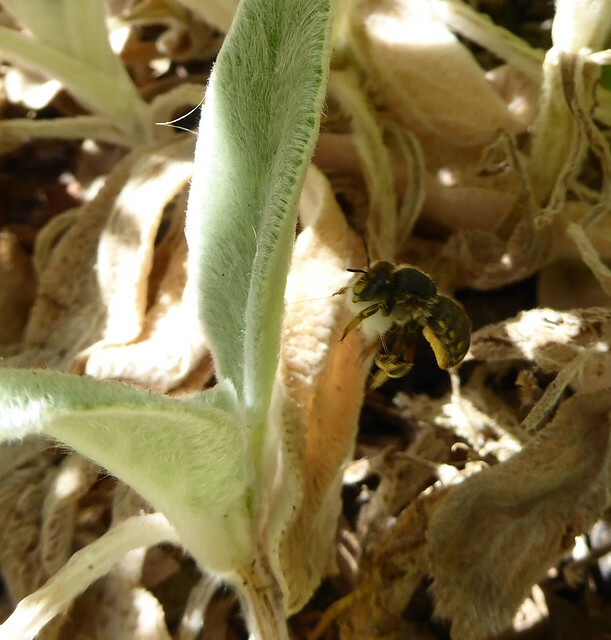 Once she has identified a suitable site, the female strips or “cards” woolly fibrous material from plant leaves with her mandibles (hence the name wool-carder) and takes it back to her nest to line and plug the cavity (see the pictures below). 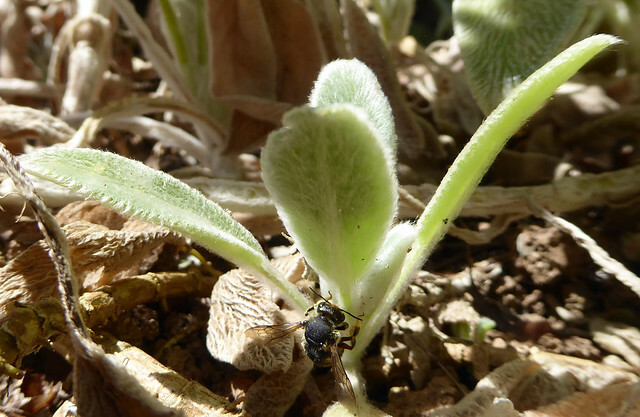 Lamb’s Ear leaves are a popular choice for “carding” but Great Mullein or Yarrow can also be used. 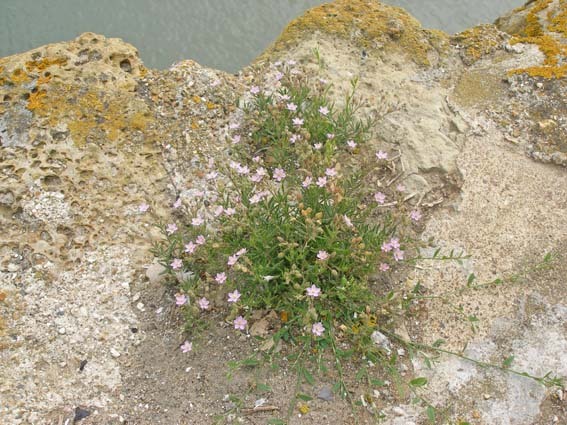 If you look carefully at the leaves of these plants you can sometimes see bare areas where she has been actively collecting fibres. 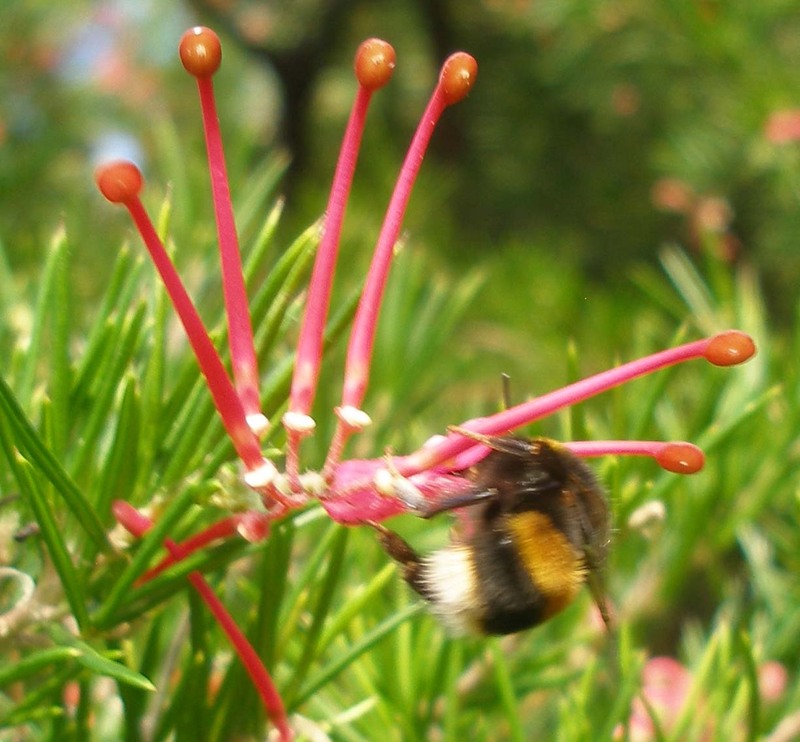 Within the nest, she lays eggs and equips them with a mixture of nectar and pollen. The eggs develop in the nest where they stay until new bees emerge next summer and the whole cycle begins again. 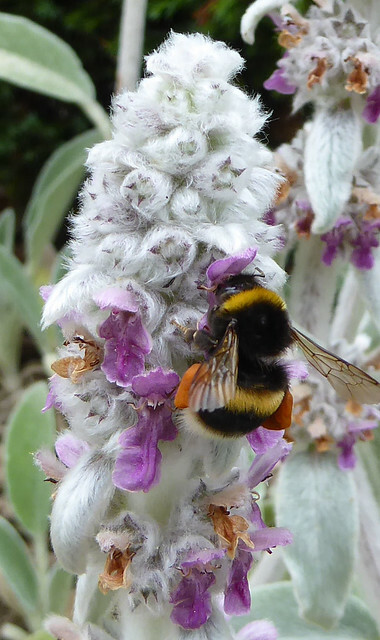 So, if you have a patch of Lamb’s Ear in your garden take a look, there’s a good chance that wool-carder bees will be using it and you too can be enthralled by their antics. 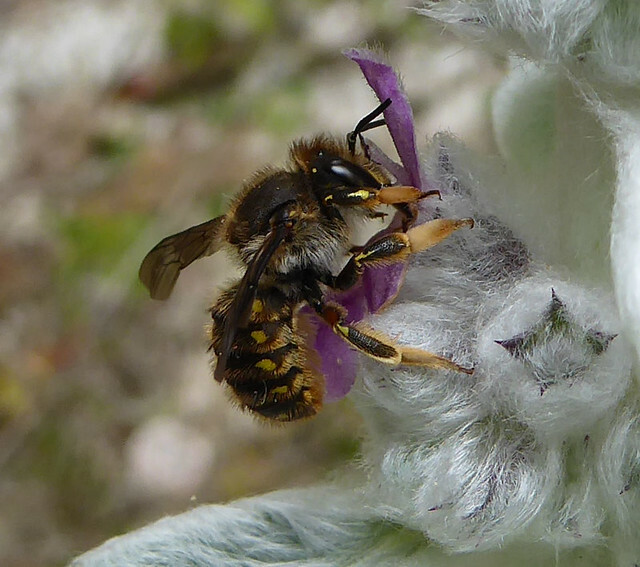 Male wool-carder bee – look at his spines.